It wasn't long ago that we told you of Chris Wilkins newest Kickstarter for The Crash 2018 Annual; A revival of the classic ZX Spectrum Crash magazine, wrapped up in the guise of a Christmas annual, with a brand new Oliver Frey Christmas cover! 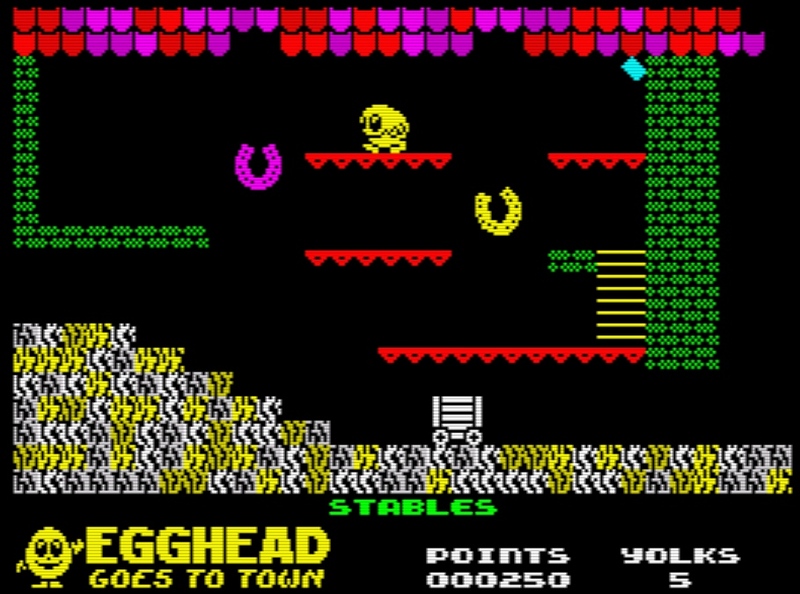 Well after a big success raising £46,990 and a number of people receiving Crash Mugs already, we have an exclusive look at EGGHEAD Goes to Town; a brand new ZX Spectrum game by Jonathan Cauldwell, which was listed as one of the support pledges in the Kickstarter! Now featuring music by Yerzmyey with loading screen by Graham Richards, EGGHEAD is another Eggy game in a series of games which began all those years ago in the 90's on Crash Powertapes by the same creator of Jonathan Cauldwell, who is also behind the ZX Spectrum software Arcade Game Designer. 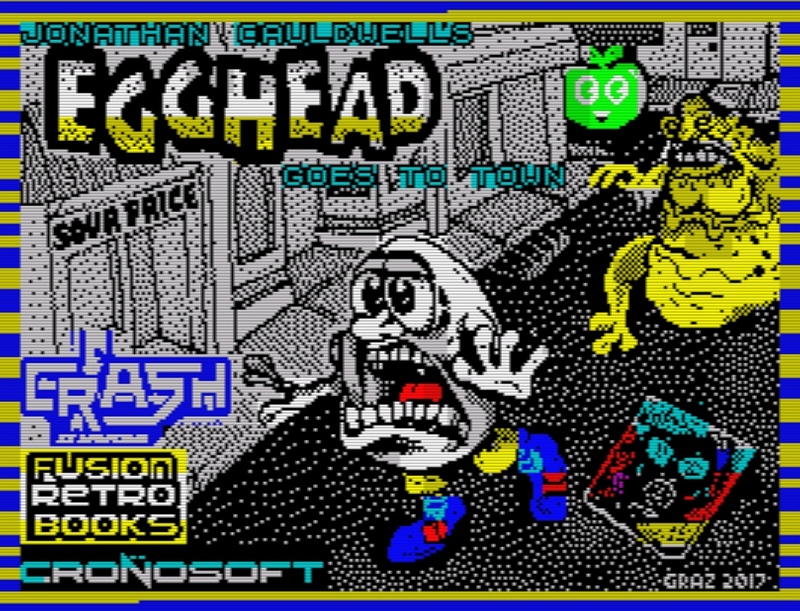 Unlike all those years ago however, in this version EGGHEAD is on a mission to find the pieces of a Crash magazine which have been blown around town after being left carelessly on a pub garden table, with the writers getting drunk inside the pub. EGGHEAD Goes to Town is a lovely game indeed, I love all the different themed levels as if you were walking about the Town, with a Stables, Beer Garden, Market Place and even the Haunted House. I really like the layouts as well, that although require timing, don't make it impossible to complete to the point of throwing a keyboard out of the window in just the first screen. The game also has a lovely soundtrack by Yerzmyey, but the only issue I found with this is the point that coming in to the levels don't always play any music. So I'd leave, come back, leave come back and then it would play again. Other than that, that's the only issue ( if it is an issue? ) 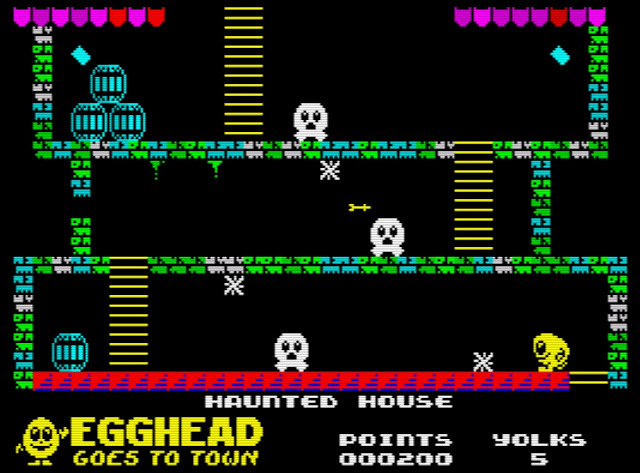 that I could find, as the game is a joy to play and you'll really like it when it arrives through your front door!